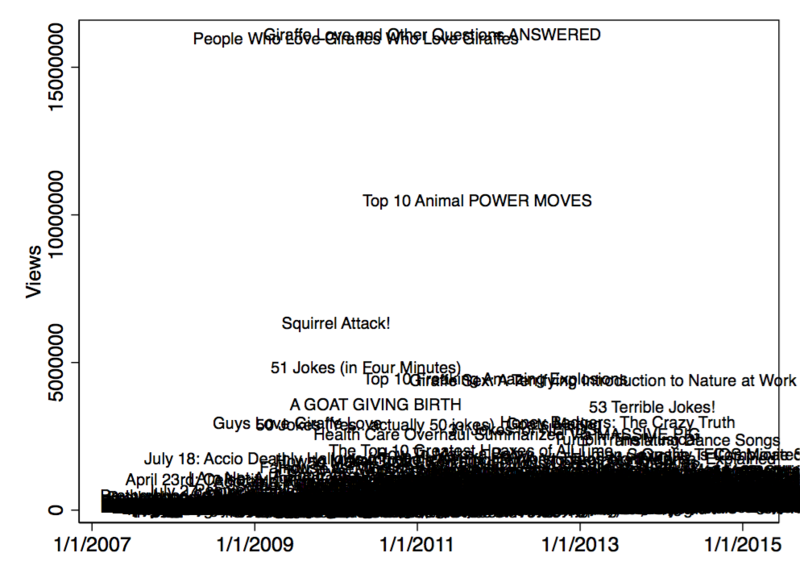 Archive for the ‘Data analysis’ Category. Scroll down for nice plots! Watch the video here! Who made it? 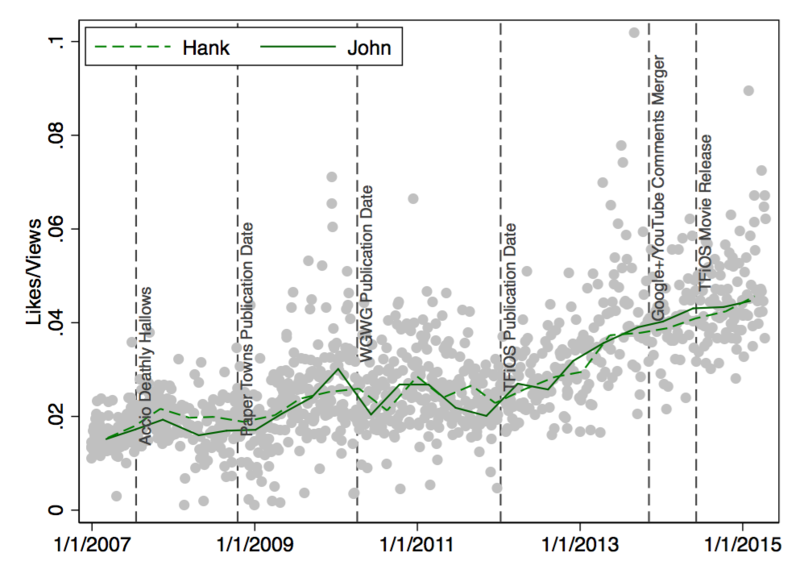 Hank-only, John-only, or both? The second variable of interest is the Date. In other words: When was the video put online? The length of the videos is not that interesting because most clock in just under 4 minutes. (NB: Longer videos were not included in the original data set.) There is just not enough variation. So I’ll just have one quick plot at the end. 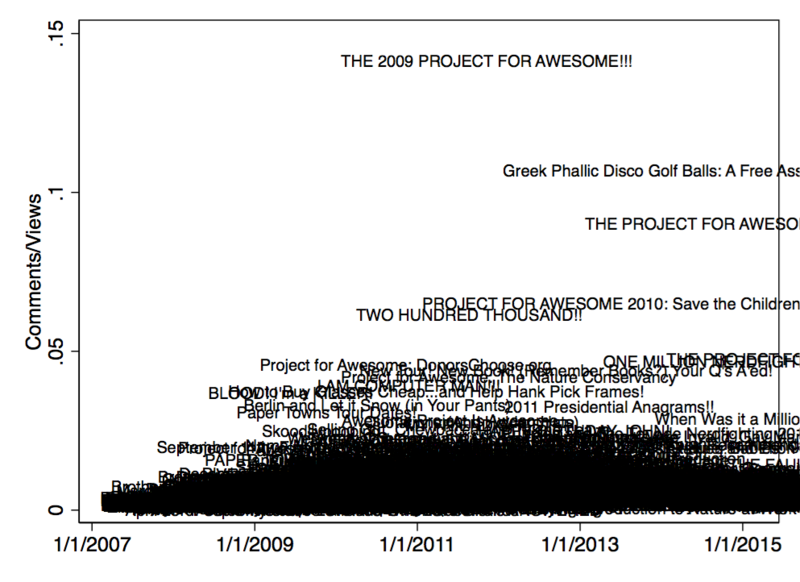 Speaking of plots, most of the analysis will be graphical. This is pretty much a census, so there’s no need for statistical testing. Also, it’s all quite exploratory. Here we go: Who tends to have more Views? 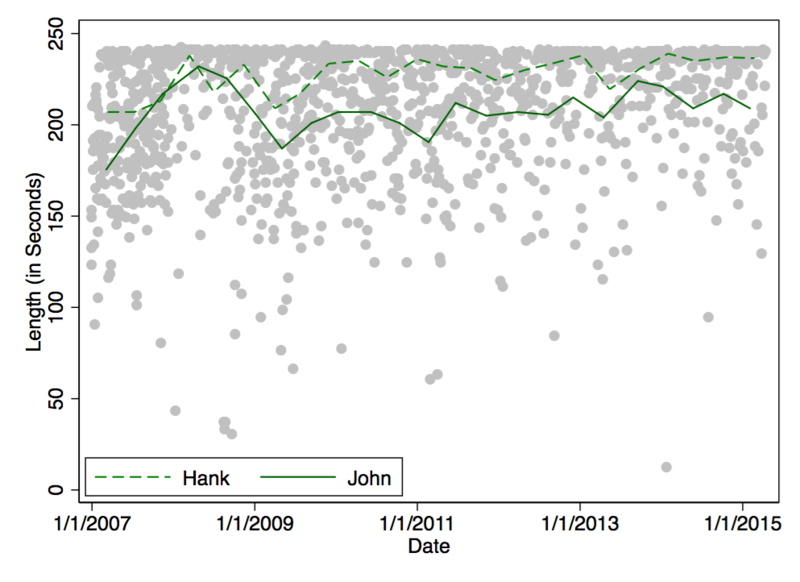 Here is the median view count for each brother: Hank: 256k, John: 286k, both: 347k. 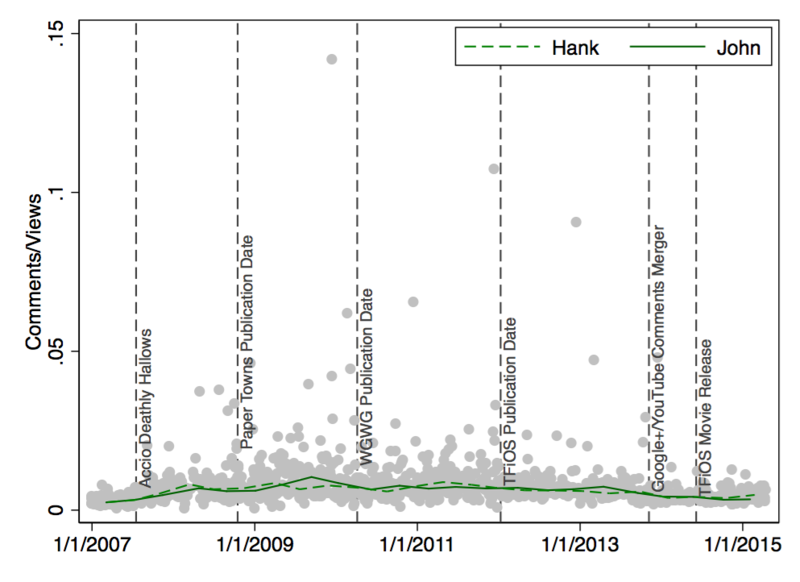 This means that 50% of Hank’s videos have more than 256k views, and the other half of his videos have less than 256k views. So John’s videos tend to get more views, but still less than reunion videos. You can also look at the means (M) and standard deviations (SD) – but there are some influential outliers that impede the interpretation of the numbers (Hank: M = 378k (SD = 537k); John: M =467k (SD = 1112k); both: M =367k (SD = 183k)). 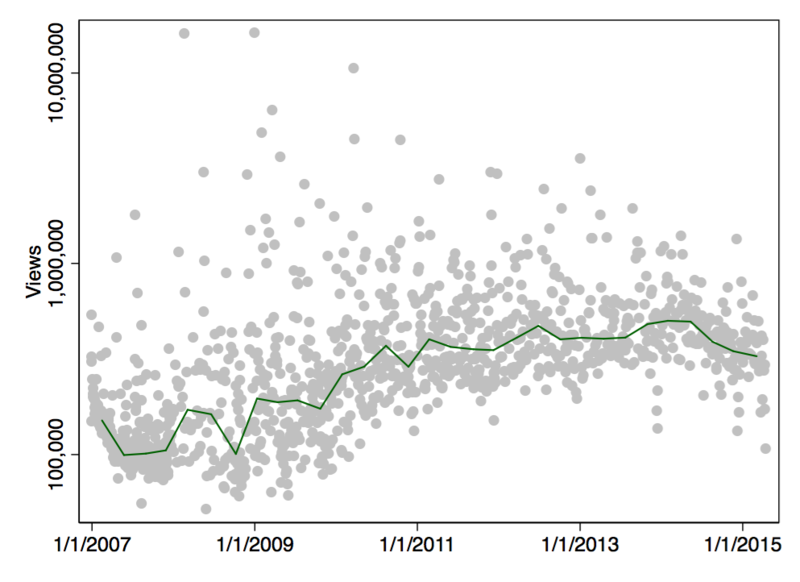 This plot shows the view count changes across time. The solid line is a median band. It indicates how many views a video needs at a given point in time to have less views than half of the other videos. Did the movie version of The Fault in Our Stars lead to fewer views? I don’t think so – this is mostly speculation, anyway. There could be many reasons why Nerdfighters might be watching fewer videos (CrashCourse, SciShow, Tumblr, jobs, kids). Personally, I think that the more recent videos just haven’t accumulated as many views from new nerdfighters who go through old videos (and from random strangers). 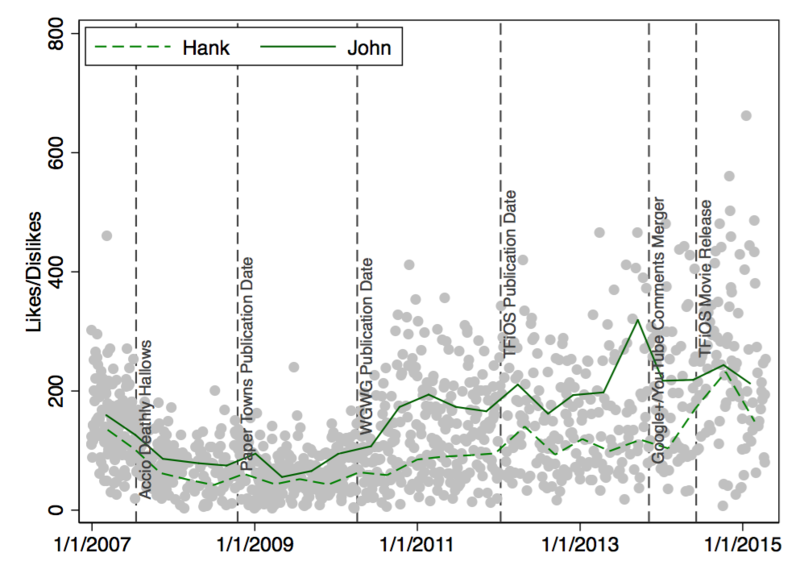 My interpretation would be that the view counts of Hank and John didn’t really develop differently. So far, so good. Now what about actual appreciation? 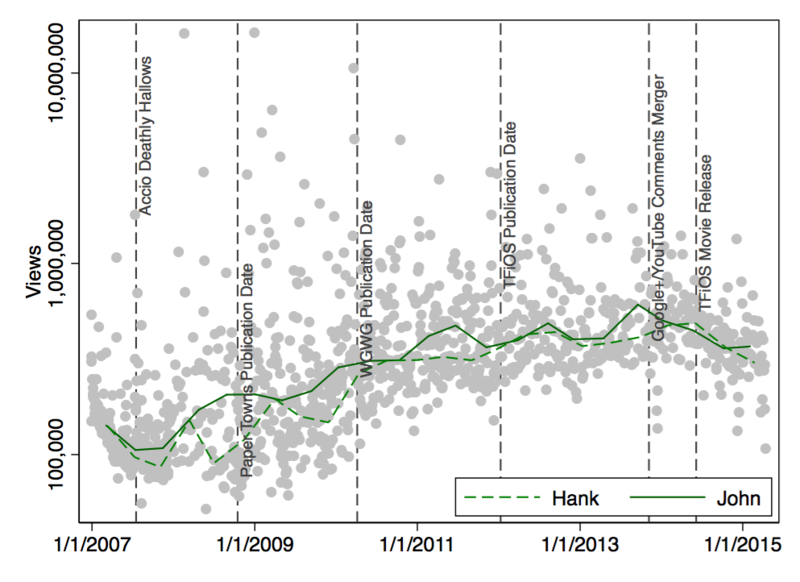 When I look at the median values for Likes per View, Hank’s videos are liked by 2.3% of viewers. John’s videos are liked by 2.2% of viewers. Reunion videos are liked by 3.3%; Nerdfighters seem to like reunion videos! There were even more Likes than Dislikes during the past few years. This development occurred especially for John’s videos. The number of Comments per View has declined over the past two years; possibly due to the integration of Google+ and YouTube or the new sorting algortihm for comments. The last couple of plots brings us back to the length of the videos. Here are the titles of the shorter videos. PS a day later: I turned this post into a video. The initial text along with the analysis commands are listed in this Stata do-file. Woher wissen Sie das alles eigentlich? Part of my job is statistical consulting. Recently, I explained the use of plausible values in PISA to someone, who then asked me a question I found very interesting: “Where did you learn all this?” I really liked this question, because it goes beyond the search for a particular solution to a particular problem. So now I resolved to ask it myself more often when I get advice from others. Category: Data analysis | Comments Off on Woher wissen Sie das alles eigentlich? 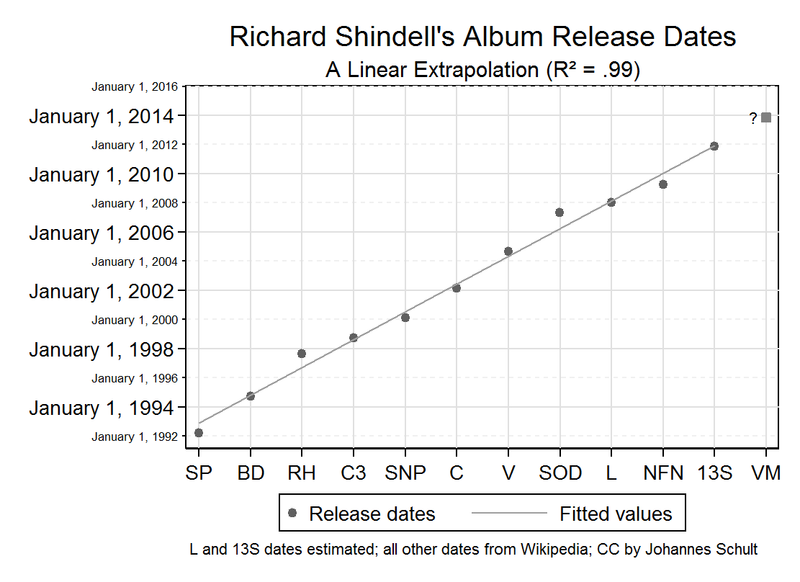 Richard Shindell has been working on his next album for quite some time now. His fans (that includes me) try to be patient. Several new songs have already made their live debut. The album is supposed to be called “Viceroy Mimic” (VM), but a couple of weeks ago he also mentioned “Same River Once” as a contender. Pressed about a release date, Shindell said (during a recent concert in Boston) January 2015. Regardless of this, here’s the statistical perspective – just for fun! 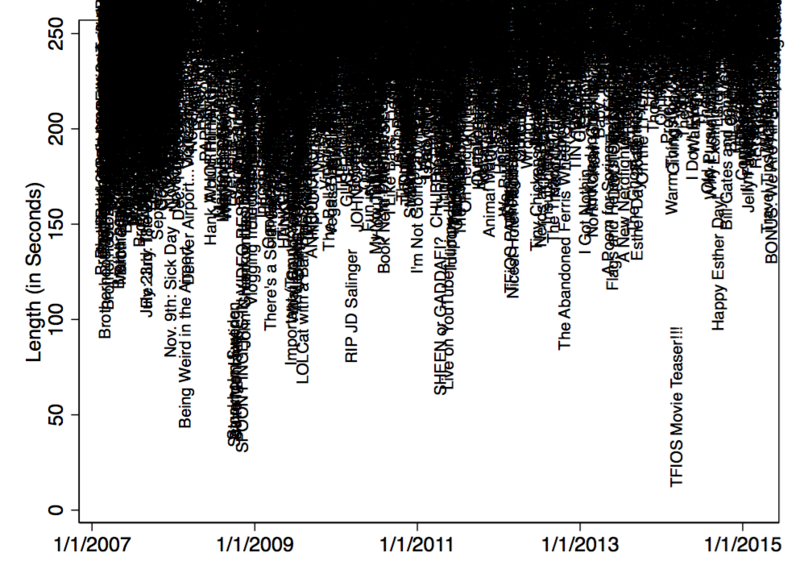 The linear trend across all album releases (including live albums, cover albums, Cry, Cry, Cry etc.) suggests that a new album should have been released on November 4, 2013. 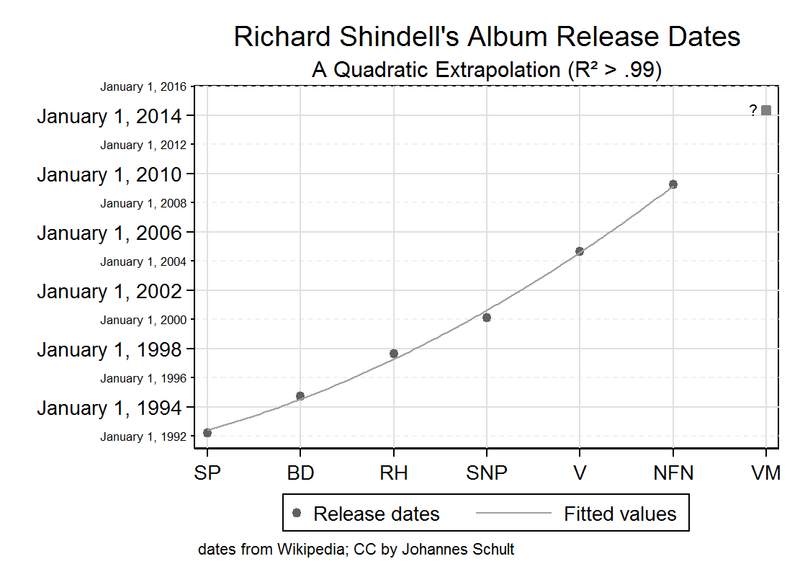 The quadratic trend across Richard’s original studio albums, however, would imply a May 11, 2014 release date for “Viceroy Mimic”. The linear prediction appears to be worse in this case; it the lag between original albums is increasing. Given the projected 2015 release, a cubic function might be necessary, soon. Anyway, below you can find the detailed data and the Stata code to replicate the graphs. Zum Ende der 2. GEBF-Tagung in Frankfurt habe ich ein paar Überlegungen festgehalten. Sie beziehen sich nicht zwingend auf die konkrete Konferenz, die insgesamt sehr kurzweilig war (und u.a. Kekse beinhaltete). Hilfskräfte mit Wasserpistolen ausstatten, die immer dann zum Einsatz kommen, wenn ein Redner die Zeit überzieht! Ich fände es auch sinnvoll, eine Datenbank mit der Vortragsdauer (bzw. der jeweiligen Abweichung von der vorgegebenen Redezeit) anzulegen, damit bei zukünftigen Tagungen die “Überzieher” (Konferenz-übergreifend) identifizierbar sind. Kekse anbieten! Zur Not die Teilnahmegebühr erhöhen. Zum Starten von PowerPoint-Präsentationen F5 drücken! Ich persönlich wurde freilich das pdf-Format bevorzugen (bzw. ganz auf Folien verzichten). Bei Adobe Reader ist Strg+L die Vollbild-Tastenkombination. Wer in einer Session zuletzt vorträgt, kann sich häufig die Einleitung sparen! Eine wiederholte Vorstellung der Konstrukte und Theorien ist redundant. Vielleicht wäre es eine gute Idee, beim Tagungsbüro in der Nähe einen Stadtplan auszubreiten bzw. aufzuhängen, damit die Teilnehmer sich besser orientieren können (ÖPNV, Restaurants, Kneipen, Plattenläden). Scientific work requires transparency. There is no mad genius in his/her lonely tower working for years on end on some great invention. While it may be true that professors have little time for anything but their research, they communicate their findings (along with their methods). Science is a social enterprise. Primed by Gary King‘s essay “Replication, Replication” (1995) and lectures by Rainer Schnell, I arrived at the conclusion that a scientific workflow must be a reproducible workflow. I do think that making replication material broadly available is a good thing for everyone involved. Replication materials for my recent publications can now be found online. Maintaining a reproducible workflow is hard work but rewarding. Looking back, I could have improved a lot of things (without changing the results, mind you). It felt a bit awkward at first. Soon enough it felt even more awkward to have waited so long to put up the material. I wish I could share more of my older publications (and also raw data) but privacy laws, work contracts, and fellow psychologists who are highly skeptical of these ideas keep me from doing so. Hopefully, the present material is just the beginning. Sadly, most psychologists do not share their materials publicly so I had to figure out most stuff on my own. I decided against third-party repositories because some focus solely on data sets whereas others are somewhat difficult to handle. So I wrote the HTML by hand hoping that a plain format allows for longevity. Let me know if you have any suggestions for improvements. Category: Data analysis | Comments Off on Replicate My Work! The first round of the SpinTunes #3 song writing competition is over. Lo and behold, I made it to the next round! So needless to say I’m happy with the results. But equally important, the reviewers provided a lot of feedback. One is often inclined to retort when faced with criticism. Musicians even tend to reject praise if they feel misunderstood. I’m no exception. But this time around I actually agree with everything the judges wrote about my entry. (I Love the Dead – remember?) There wasn’t even the initial urge to provide my point of view, shed light on my original intentions. I will now go into the details, before I turn to a quick statistical analysis of the ratings in the last section of this post. The incubation period for this song was rather long. At first, I was considering writing about the death metal band Death. It would have meant stretching the challenge and alienating anyone unfamiliar with the history of death metal (read: pretty much everyone). The only reminiscence of heavy metal in my actual entry is the adaptation of Megadeth’s “Killing Is My Business and Business Is Good”. I toyed with the idea of celebrating the death of a person who has lived fully and left nothing but happy marks on the lives others. Translating this idea into an actual song was a complete failure, though. I also considered writing about mortality statistics. There’s people who estimate the space needed for future graveyards and health insurances and so on. I’m somewhat familiar with the statistics behind that. But it would have taken weeks to turn this into a cohesive songs. So I returned to the notion of the happy grave digger. (Yes, Grave Digger is the name of a German metal band.) The working title was “Grave Digger’s Delight”. The music started with the chorus while I was playing an older idea I hadn’t used so far. Basically, I threw away the old idea except for the initial G-chord and the final change to D. I did add the intro melody, more on that soon. The verses are the good, old vi-IV-I-V, but with a ii thrown in for good measure. That’s not too original, but I was already running out of time. The lyrics started out with a word cloud of related terms. Plots With a View was a big inspiration when it came to the sincerity behind the mortician’s word. Here’s a person who’s dedicated to his job! I had wanted to include a couple of fancy funeral descriptions. But the music called for more concise lyrics. All that’s left from that idea is the line “I can give you silence – I can give you thunder”, which I kept to rhyme with “six feet under”. That one is indeed very plain, but I felt that the huge number of competitors called for a straight song that brings its message across during the first listen, preferably during the first 20 seconds. I think I succeeded in this respect. (This also a major reason why I changed the title to “I Love the Dead” – keeping it straight and plain.) The 2 minute minimum length gave me headaches. This made me keep, even repeat, the intro melody. I was tempted to use a fade out. But I always see this as a lack of ideas. So I used the working title for the ending. Given a few more days I might have come up with a more adequate closure. Even as I was filming the video, I felt the need to shorten the ending. I tried to spice up the arrangement with a bridge (post-chorus?) of varying length. I wasn’t completely sure about it during the recording process, but now I’m glad that the deadline forced me to keep it as it is. At one point I had a (programmed) drum track and some piano throughout the songs. To me it sounded as if they were littering the song rather than filling in lower frequencies. So I dropped them and just used a couple of nylon-stringed guitars (one hard right, one hard left), a steel-stringed guitar (center), a couple of shakers, lead vocals plus double-tracked vocals and harmony vocals in the chorus (slightly panned) and, of course, the last tambourine. TL;DR – I appreciate the feedback and I resolve to start working on my next entry sooner. Wait, what? Let’s just focus on one criteria for exploring the factor solution: Eigenvalues larger than 1. 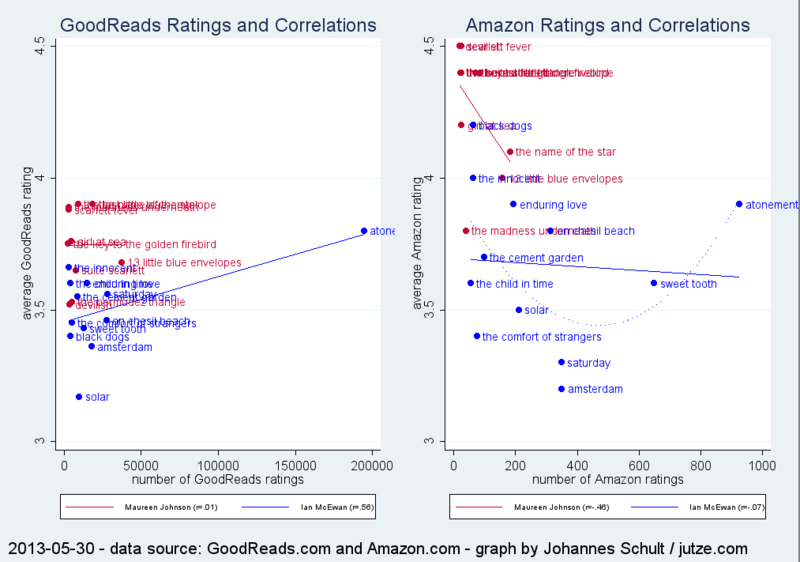 Here are two such factors, which suggests that the rating data represents two (independent) dimensions. (For those familiar with the method: I tried a few rotated solutions, but they yield similar results.) Now the first factor explains almost half of the variance at hand whereas the second factor has a much smaller Eigenvalue and subsequently explains only 1/8 of the variance in the data. Without going into statistical details, let’s say that the loading indicate who strongly each rater is related with each factor. 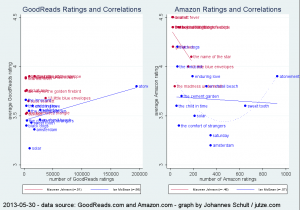 For example, Blue’s ratings have less to do with the overall factor than Mike’s ratings. Both rater’s show rather high loadings, though. Given the high loading of all raters (except one) indicate a high level of general agreement. The only exception is Ben, whose ratings have little to do with the first factor. (You could argue that he even gave reverse ratings, but the loading is quite small.) Instead, his ratings play a big role in the second factor (which is by definition statistically independent from the first one). There is some agreement with the remaining variance of David’s ratings and a negative relationship with the popular vote (if you use the somewhat common notion to interpret loadings that are larger than 0.2). So there appears to be some dissent regarding the ranking. 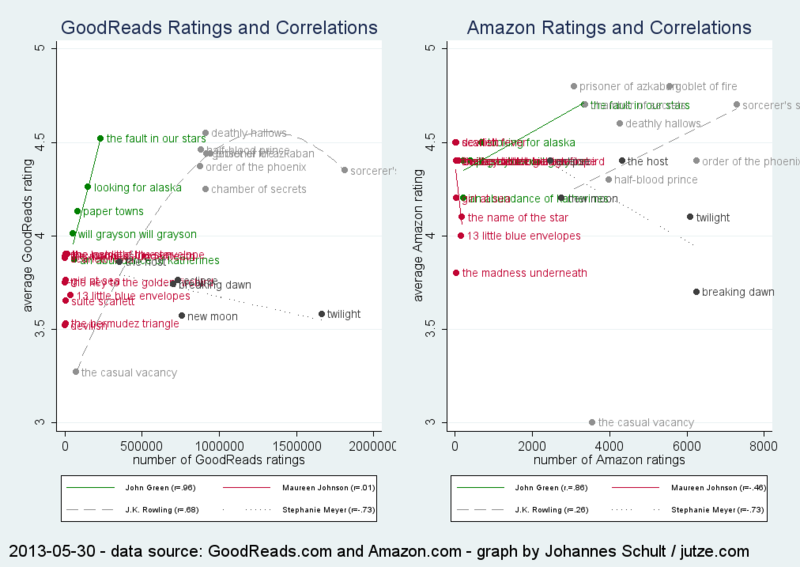 But on the other hand, the “dominant” first factor suggests that the ratings reflect the same construct to a large degree. Whether that’s song writing skills, mastering of the challenge, or simply sympathy, is different question. PS: I must admit that I haven’t listened to all entries, yet. It’s a lot of music and I’m struggling with a few technical connection glitches. Anyway, I liked what Jason Morris and Alex Carpenter did, although their music wasn’t that happy. Another entry that necessarily caught my attention was Wake at the Sunnyside by the one and only Gödz Pöödlz. Not only did they choose the same topic I used, they also came up with a beautiful pop song and plenty of original lyrical ideas. Good work! 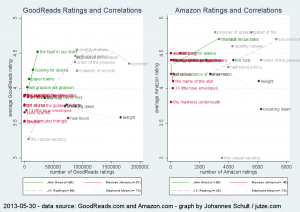 Here’s a short list of blogs featuring statistical content. It’s basically the bookmarks I keep in my browser under “funny, thoughtful, helpful, interesting”. I enjoy reading them even when I’m not looking for a particular solution or inspiration.